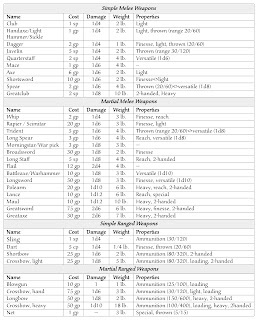 I really like the armor table for 5e. Good range of choice, not too short, not too long and there are just enough differences and overlaps that your choice of armor is meaningful and distinct. Simple and interesting. The weapons table for 5ed is probably one of the least thought out and most poorly implemented mechanics in the Player's Handbook though. Loads of redundancies (Why would I ever buy a mace when a quarterstaff does the same damage, is 20 times cheaper and can be used with 2 hands for even more damage? ), Shortswords and scimitars being the same except vast price difference, longsword, warhammers and battleaxes all being the frigging same weapon, etc. It seems to have been built around weighing different damage types as more valuable than others, no matter that the differences almost never come into play. Except it's inconsistent. A warhammer is bludgeoning, but pricier than a slashing battleaxe. Otherwise the same. A maul is bludgeoning but way cheaper than a slashing greatsword. Otherwise the same. Whatever. There's a handful of weapons worth taking and loads that are pointless and a waste of space. 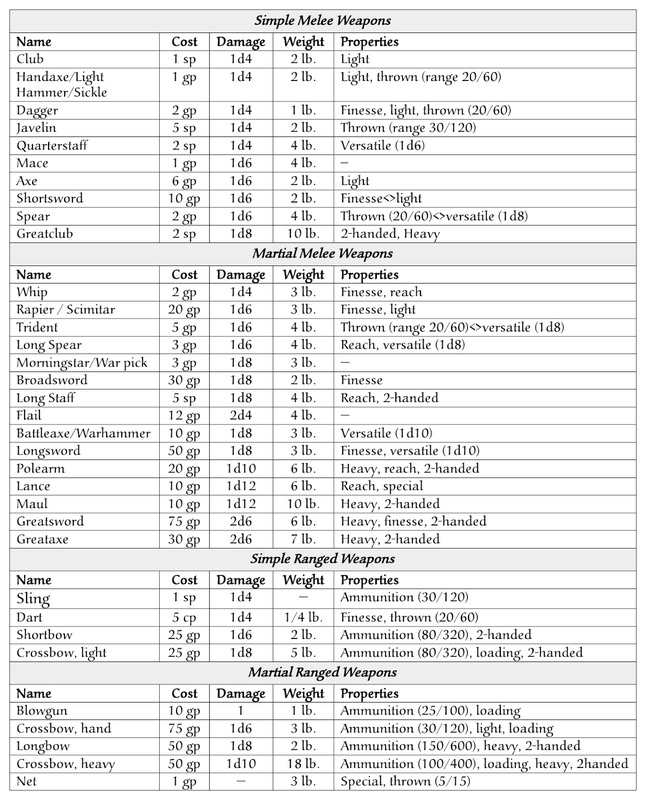 Here is the revised weapons table Note absence of damage types [PDF]. For Into the Unknown, I've done away with the three damage types for simplicity since the edge cases where they come into play are extremely rare and common sense applicable at any rate (yes your sword can slash and stab, no your rapier can not bludgeon. Yes, you can swing your spear like a staff). With that done away with, the weapons table showed itself up for what it was - Just too awful to keep as it is. So I changed things up a little and tried to give each weapon choice a niche. It really didn't take much work. <> This weapon has two properties that can not be used together. For example thrown<>versatile, can be used with two hands, but thrown only with one. I think it's kinda self-explanatory. You can throw a spear, but not for 2-handed damage. Spear earn their mettle as the most popular weapon of all time by being the only simple weapon that's versatile, can be thrown and gives 1d6/1d8 damage, making it the best damage dealer (alongside the greatclub) among simple weapons. Long spears (new) are martial, swap thrown for reach but otherwise identical to spears and are the only reach weapons that can be wielded one-handed. Long staves (new) are martial, not versatile, but have reach. and way cheaper than polearms who go one higher on the die, but are also heavy. Swords are pricey, but there is good reason why they are so universal kings among weapons - They are all frigging finesse baby. That's why you pay a premium for them. Shortswords lose the Light quality if you want finesse on top, but become simple weapons, making it the highest damage dealer among simple finesse weapons. Longswords gain finesse to distinguish themselves from battleaxes and warhammers. Greatswords they same vs battleaxes (who bumb to 2d6 whilst the cheaper and simpler maul goes down to 1d12). I added broadsword to the list as well - they took rapiers entry who got bumped down to scimitar level - The point of scimitars and rapiers here is that they are the top dogs for dualwielding with finesse. Because come on, a broadsword is just better than a flimsy fencing weapon. If you want a better flimsy fencing weapon, call the broadsword 'edged rapier'. Why do we like flails? They may be pricey with the chain to forge and balance, but they deal 2d4 instead of the 1d8 of the cheaper morningstar. I folded Pike, Halberd and Flail into "Polearm" - Because they are all the frigging same anyway. There is more, but the bottomline is that there is a point to choosing the different weapons from this table now.